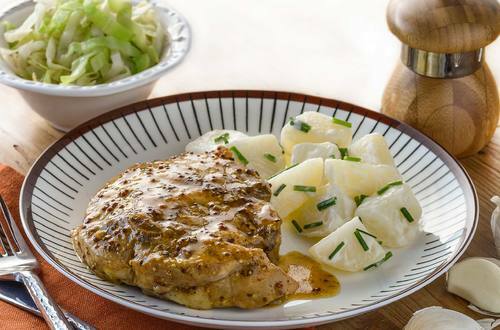 Enjoy a perfect summer roast with our honey mustard pork recipe with warm potato salad. Prepare and cook in just 35 minutes. 1 Preheat oven to 180°C. Place pork and mustard in the bag and add Recipe Base, seal with tie provided and gently rotate to cover. 2 Place on a baking tray and cook for 25 minutes. 3 Boil potatoes until tender, drain and allow to cool a little before stirring through mayonnaise and chives. Serve with pork chops. Hint: Serve with lightly stir fried spring cabbage.